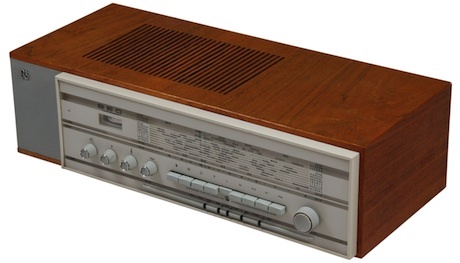 The Beo 610 (also known simply as the “Beo” and sometimes called “Beobox” in some catalogues) was B&O’s largest battery radio. Appearing soon after the much more popular Beomaster 900K, it was a large and fully transistorised table set that could be operated independently of mains electricity. A mains unit could be bought separately which fitted inside the cabinet in place of the battery tray. 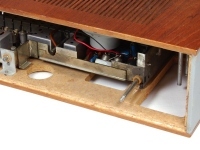 A smaller battery of the type used in the Beolit 600 holder could then be installed to the side which could then be accessed though a hatch in the bottom of the cabinet. A pushbutton at the rear then selected which power source was used. The mains unit was complex, featuring an electronic regulator and two outputs. Using it offered a small amount of extra output power when compared to battery operation alone. Text copyright © Beocentral. Unauthorised reproduction prohibited. In styling terms the Beo 610 looked like an oversized Beolit De Luxe 611-FMT. It was designed for horizontal operation only and had no handle, a large elliptical loudspeaker was installed horizontally under a grille on the top of the cabinet. The extension to the left of the dial, covered in grey vinyl, served no particular function. 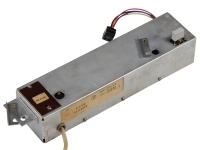 It contained neither the loudspeaker nor the mains unit and could easily have been dispensed with by moving the mountings for the auxiliary battery holder and making the mains unit a slightly different shape. However, in the context of mid 1960s design and architecture, such odd asymmetric forms would have appeared fashionable and progressive, especially when expressed in severe straight lines. Text copyright © Beocentral. Unauthorised reproduction prohibited. Technically the Beo 610 drew from both the Beomaster 900K and the Beolit De Luxe 611-FMT. The chassis was unique to the model but many of the assemblies and circuits were familiar from elsewhere in the range. 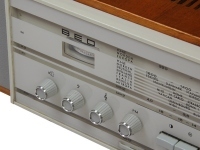 Unlike the Beomaster 900K the tuning dial was not illuminated, however the tuning/battery meter could be lit by pushing a button but this did not latch to avoid wasting the batteries. 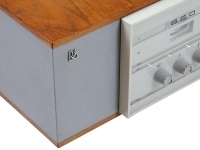 External aerials, an external loudspeaker, a record player and a tape recorder could all be connected, making it possible to use the Beo 610 as the centre of a small audio system. Text copyright © Beocentral. Unauthorised reproduction prohibited. Despite good performance, the Beo 610 did not sell well. Those looking for a quality battery set that could fill a small room with quality sound chose the Beolit Deluxe 611-FMT and those who wanted mains table sets had the choice of the Beomaster 700 (another unpopular model) and the top selling Beomaster 900K. 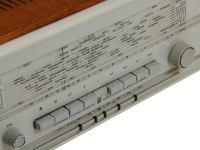 There was no replacement model, instead mains adaptors begun to be made available for the new Beolits, such as the Beolit 1000 that appeared a few years later. Text copyright © Beocentral. Unauthorised reproduction prohibited.